Using rubber stamps is got to be rigt at the top of my list when it comes to making cards and invitations. There are so many fun patterns and images available in so many different types of stamps and rubber stamping products. These day the traditional wooden mounted stamp is still alive and kicking, but there are also the newer clear and cling mount stamps. 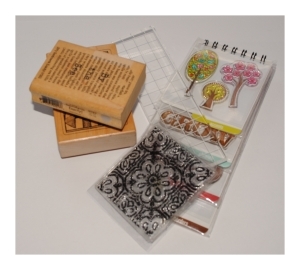 These stamps are made from a completely clear rubber material in which you mount yourself to a clear acrylic block. The rubber can easily be mounted and removed over and over again so that you are able to arange different images and even fonts however you want to. It's so muchmore versatile and easy to use as well. Because the stamps are clear you are able to see exactly where you will stamp on the paper, and even make sure you have distributed the ink evenly. I am still a big fan of wood mounted stamps but clear stamps are my personal fave right now. Aside from the stamps themselves there are so many fun and interesting products to pair with your stamps! There are inks in just about every color and texture imaginable. Then there is the embossing inks and powders which is how you get that raised ink look you sometimes see on commercially printed invitations. Not to mention adding textures with glitter or flock, or even just coloring your images in with some good watercolor pens. Pretty much any and all invitations are made from some sort of cardstock paper. But with the explosion of paper crafts hobbyist and scrapbookers there are so many more options for choosing a cardstock to make birthday invitations with. Peruse the paper aisle of any arts and crafts store, or even stationery stores and your will find an array of cardstock papers in different colors, textures, and weights (thickness). Choose from pretty much every color under the sun, embossed papers, glitter papers, metallic and pearlescent. You name it! And one of my personal favorite options for buying cardstock is the blank pocketfold and pochette invitations. These are a really cool and unique cardstock base in which folds into itself to become both the invitation base and envelope. A pocketfold can lend style to even the most dreary of invitations. To use them all you must do is insert a piece of paper with your invitation wording written on it and you've got a great handmade invitation in itself. Add some printed graphics or even stamped images and you've hit a homerun! If all of this arts and crafts and hand crafted stuff overwhelms you you can always go with a printable invitation. The beauty of printable invitations is that you can customize and personalize them, but a lot of the tedious steps are omitted. In some cases all you have to do is add your own wording and print on a paper of your choice. If you still crave a little hand crafted touch you can add your own paper backing, ribbon, or charms. Place your printed invitation into a blank pocketfold or pochette! 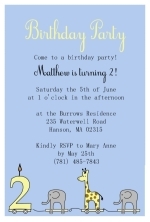 To make birthday invitations using an invitation template is an easy way to get handmade invitations using your home computer printer. To create invitations with a template all you have to do is download one our printable birthday invitations, change the wording within the template to match that of your upcoming party, print it, and trim the paper. If you print on a nice=ce heavy cardstock then that is all there is to it! But you can also take it a step or two further for fabulous and easy handmade invitations. After printing and trimming, you can then attach them to the inside of a pocketfold invite, or layer them onto a colored cardstock backing. Add your own matching ribbon or charms. The sky is the limit! In the end you will have a great handmade and personalized creation to share with your friends and family. To create your own printable invitations is a huge money saver and will give you the opportunity to completely customize your invitation. Although this option is not for everyone. If complicated software or even the thought of designing an invite from scratch overwhelms you at all then I'd skip out on this one. These day there are a bunch of free softwares online that rival programs like even Photoshop. One of my favorites is Paint.net. It is completely free to download and completely capable of using to create a printable invitation. Upload some photos, or use some free clip art or stock photography or graphics found online. Create a document sized at the same dimensions you would like to print your invitations and go to town! You can even print onto photo paper and get a nice glossy photo finish! Digital scrapbooking is becoming wildly popular and with it springs a bunch of free and cheap websites to use which are perfect for creating printable birthday invitation or to even make birthday invitations with photos. These websites come stocked with loads of graphics and themed clip art, and are just sitting there waiting for You to upload your photos and graphics and get to work! They couldn't have made it easier to crate a printable invitation with matching kits of graphics, backgrounds, and digital stickers! I recently created my own printable birthday invitations using my favorite digital scrapbooking website and will most likely use it again and again!